Perhaps you have wondered why aliens are reported to have the habit of visiting at night and leaving without spending too much time. My experiences last week may prove helpful in answering these questions. I suspected that the day would not be a normal day of translating when the person in charge of immigration paperwork in our main office put a piece of paper in front of me and handed me a pen. The paper said, “Aliens sign here.” “Me?” I asked. That was just the beginning. After signing our alien names many times it was time for us to turn in our fingerprints. It just so happens that the alien fingerprint ink is on the other side of Manila. 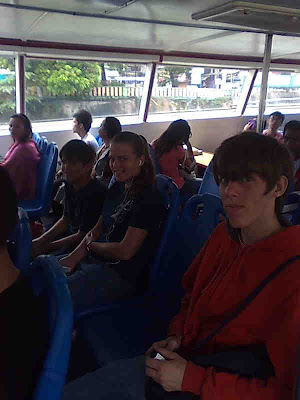 So we went out to the street and took a jeepney to the dock. We were in the habit of using a taxi every time we went in search of alien fingerprint ink, but the person in charge of aliens for our mission wanted to give us a bit of excitement. We were actually happy about this. We had heard about going on pleasure cruises and were happy that our turn had finally come. Besides, the price was only 65 cents each. 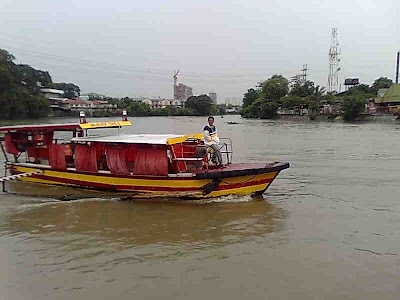 Not a bad price for a cruise on the beautiful Pasig river. Like most pleasure cruises, there were various ports of call and we enjoyed passing other boats along the way. 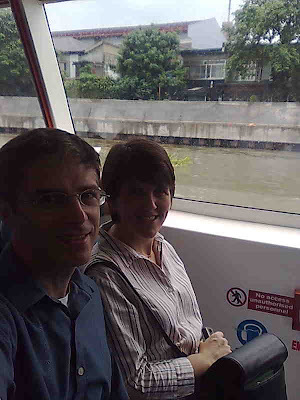 The most outstanding thing about the river cruise was that the last stop was only one block from the immigration office. We were tempted to take pictures of aliens being fingerprinted but didn’t dare. The people there are very strict with aliens and we wouldn’t want to be kicked out of the country. After we had given away every single finger print we had we headed to the street to find a way home. On the way we decided to try some earth food. 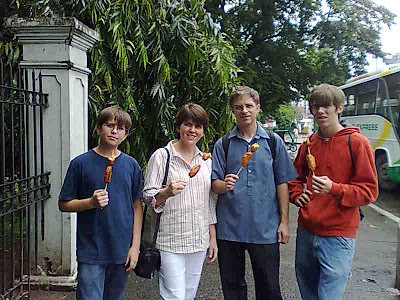 It was deep fried bananas covered in brown sugar. Earthlings sure do have strange tastes. The bananas were delicious, but with all the signing forms, traveling, and fingerprinting, I can see why many aliens prefer to make quick exits. You guys are just the cutest aliens I've ever seen! Not that I've seen any personally, but I believe they are usually quite un-nerving in appearance with their extra large craniums, pointy chins, and huge blank eyes. And these pictures don't show a bit of greenish tint to your complexions! Hope to see much more of your kind around here in the future!